Electionbuddy allows you to provide additional information about your candidates, which helps your voters make an informed decision when deciding who to vote for. 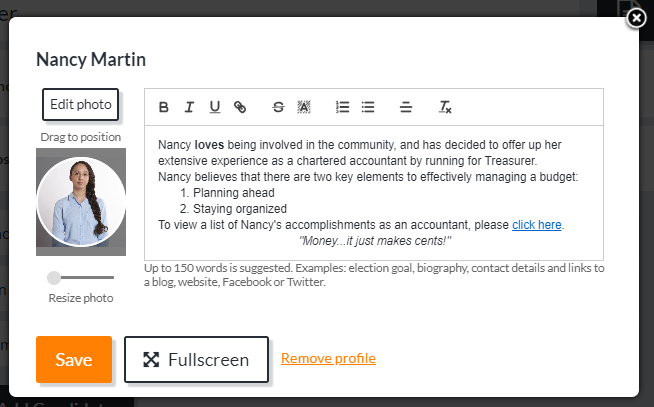 Common items to include in a candidate profile are short biographies, candidate statements, and their qualifications. 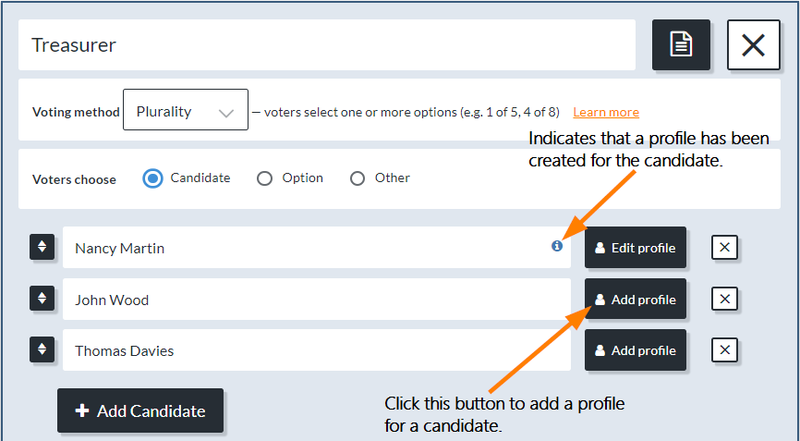 You can also include a photo of the candidate, and links to a candidate's website or profile online for voters to use to inform themselves about the candidates. 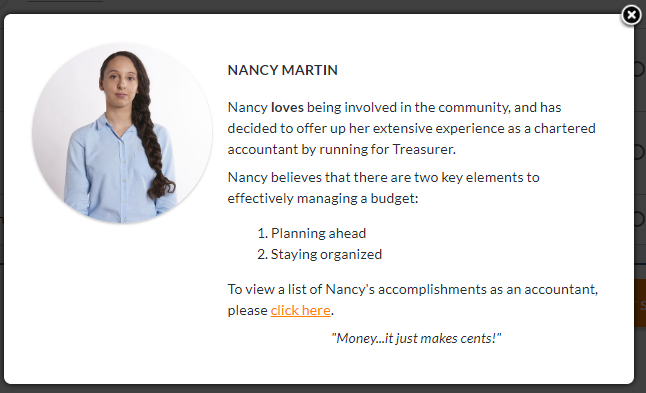 Links to a web page with more information about the candidates is the best choice if you have a candidate that wants you to include an excessive amount of text about themselves for their profile - your candidates are usually going to try and say more about themselves than the voters actually care to read. 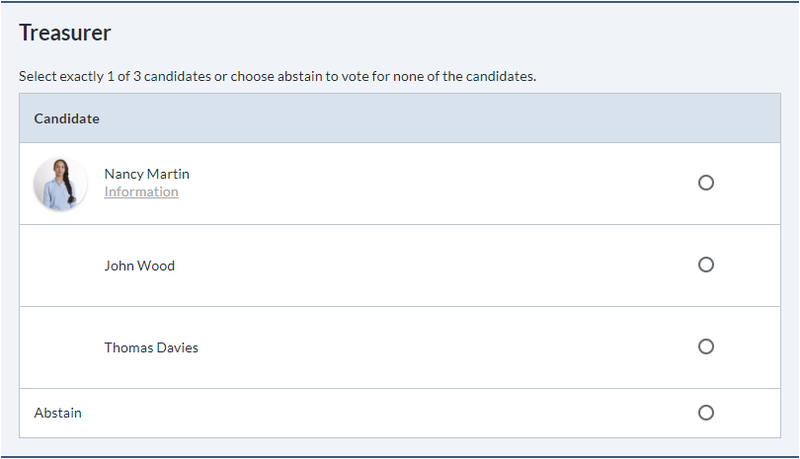 When a photo for your candidate is uploaded, you will have the option to adjust and resize the photo as needed. Candidate profile photos cannot be larger than 5 MB. If your picture isn't uploading to the profile, try checking the size of your image. As the image above indicates, you do not need profiles and photos for all your candidates - if only a few want to give a profile and picture, that's okay! Please note: clicking on the link in a candidate's profile will open up that webpage in a new tab; your voters will not have to worry about being taken away from the ballot if they click the links.